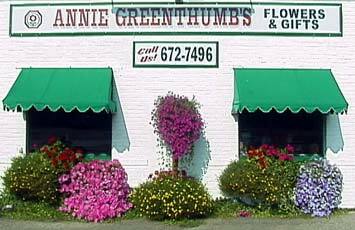 Thank you for your interest in anniegreenthumbs.com and welcome to Annie Greenthumb's Flowers, Gifts and Candy! We have served the Sheridan area for over 35 years and are proud of our excellent floral design and superior customer service. We value your business! Our owner, Linda Robbins AIFD, is one of two accredited member in Wyoming of the prestigious floral designer organization, The American Institute of Floral Designers. We invite you to look through our web pages for floral designs that are perfect to fit a holiday or special occasion. Or you can call us directly at 800-646-7899 and we will be glad to custom design something beautiful for your occasion! We have a fun gift shop with fragrant candles, fluffy stuffed animals, candy, angels, wall hangings and sooo much more! WE CAN CREATE INSTANT DELIGHT AND HAPPINESS WITH OUR FLOWERS & GIFTS! WE ARE HAPPY TO BE YOUR ONLINE AND DIRECT FLORIST FOR ALL OF LIFE'S OCCASIONS! Our commitment to you is 100% satisfaction on all your floral and gift purchases. If you are not completely satisfied, let us know by calling (307) 672-7496. Our shop serves the following areas in Wyoming: Banner, Big Horn, Dayton, Ranchester, Sheridan and Story. We carry a large inventory of traditional fresh flowers, seasonal flowers, Equadorian Red Freedom roses, green or blooming plants and dish gardens. We will be glad to meet your special floral requests with advance notice. We specialize in beautiful wedding flowers to make your special day perfect! We will be happy to meet with you for a consultation on flowers, designs and ideas for your wedding from elegant church settings to a mountain meadow weddings! We love making your wedding day as beautiful as you can imagine! We have a very nice gift line from quilted purses, wonderful fragrant soy candles, mylar balloon bouquets, soft & cuddly stuffed animals and custom make fruit, gourment, & junk food gift baskets. We'd love to custom make one for your special needs! We are the proud creators of "Sweet Annie's Candy Arrangements" that are fun and yummy! We have a large selection of baskets, mugs, baby containers, soda pop containers, etc. to choose from with a variety of candy bars and chocolates or we will design one for your specific occasion. We can create fresh flowers in a unique bouquet or a yummy candy arrangment--we love to make your gift perfect and always go the extra mile! A very large inventory of beautiful fresh flowers shipped direct from growers. Mylar & Laytex Balloon Bouquets--a single one or a room filled full!! Extensive gift line from quilted purses to wall pictures! If you have any questions or need more information, please call us directly at (800)646-7899. We're always here to serve you and make your flower-sending experience a pleasure. We do delivery to the following rural areas and small towns near Sheridan, Wy. Please call us for specific delivery charges if you have a delivery outside our city limit delivery. Delivery charge to Dayton city limits, WY is $30.00. Delivery charge to Ranchester city limits, WY is $25.00. Delilvery charge to Story, WY is $30.00. We can call the recipient to come and pick up the flower order. Delivery charge to Banner, WY is $30.00 and can vary depending on the rural adress next to the mountains. Delivery charge to Big Horn, WY is $16.95. Delivery can vary according to the rural address. Delivery of orders to rural route addresses MUST HAVE A PHONE NUMBER and cemeteries need a LOT AND PLOT LOCATION for delivery.